When I first came here, this was all swamp. Everyone said I was daft to build a castle on a swamp, but I built in all the same, just to show them. It sank into the swamp. So I built a second one. That sank into the swamp. So I built a third. That burned down, fell over, then sank into the swamp. But the fourth one stayed up. And that’s what you’re going to get, Lad, the strongest castle in all of England. We have chickens. Hens, never roosters. They provide eggs, but also a kind of spiritual sense of wellness. You walk out and look at these weird feathered lizards, who so mercilessly whallop one another while meanwhile regard the world with such bland incomprehension, and you cannot help but think: Hey, it could be worse; at least I’m not a chicken! 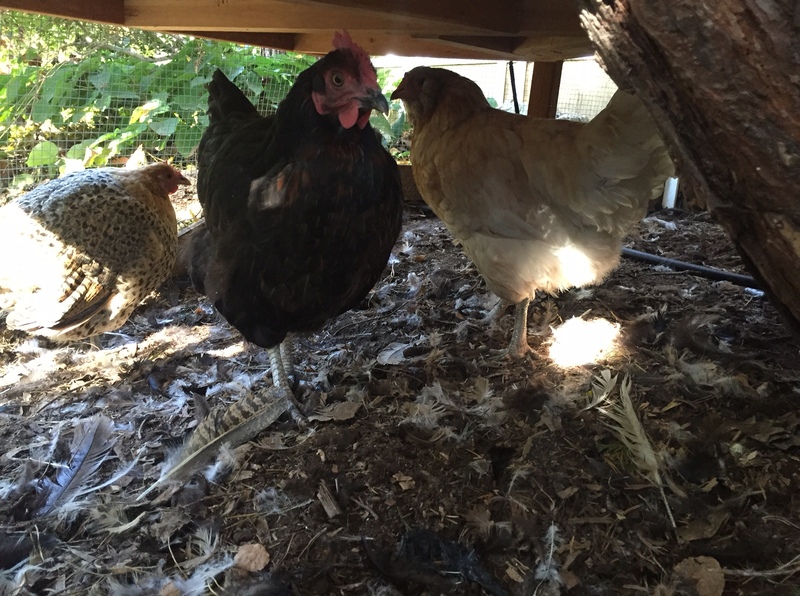 Chickens, even hens, can be loud. There was one chicken named Buffy (her breed was Buff Orpington; and also, she was a bruiser like the vampire slayer) who was particularly obnoxious. Raccoons are chicken-killing monsters. If we forgot to close the coop at night, or if a chicken decided to roost outside instead of going in, all hell could break loose at 3am. Somehow, chickens would somehow find their way into the yard and cause trouble. They would eat the strawberries. Or once, a chicken roosted on the tap handle for a keg of beer, dumping its contents everywhere. 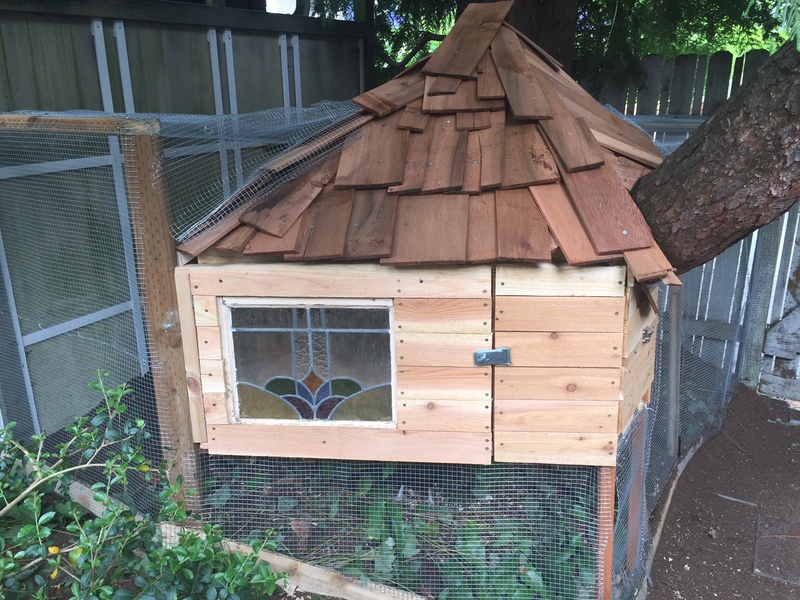 After several years of fortification, experimentation, and frustration, we gave up on the old coop and built a new coop. 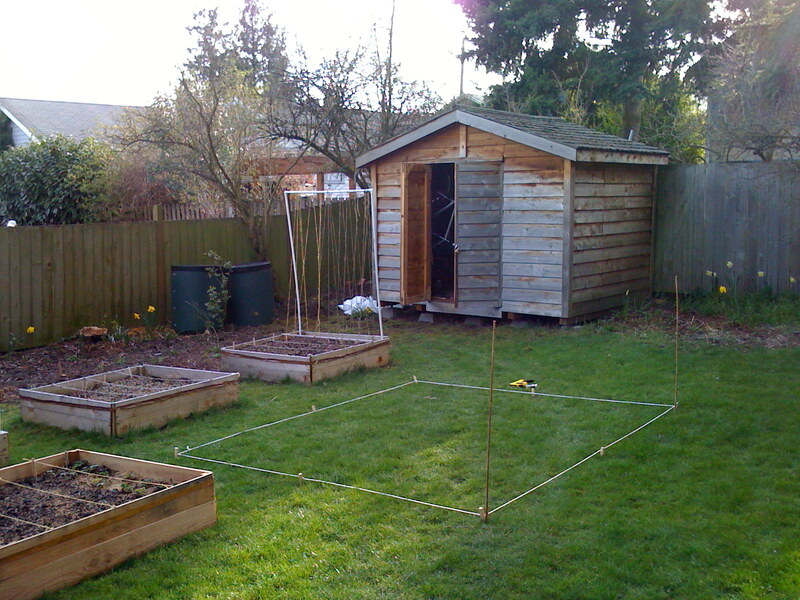 This structure was shaped like simple shed; 7′ x 9′. I can’t find the pictures right now, but suffice to say it was the Fort Knox of chickens. The only real nod to whimsy and aesthetics was that we installed a nice chandelier which was solar powered. I wanted something which could wrap around the pine, in a vaguely trapezoid shape. For bonus points, I’d incorporate a stained glass window we had found on the street several years ago. 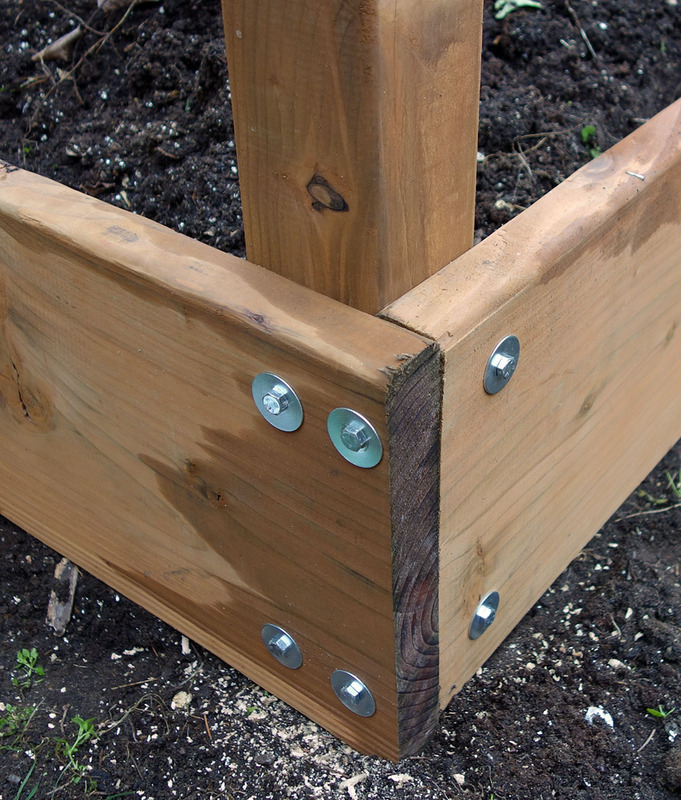 I started by placing some posts in the corners, and attaching them with level cross-lumber. Then I put down plywood. 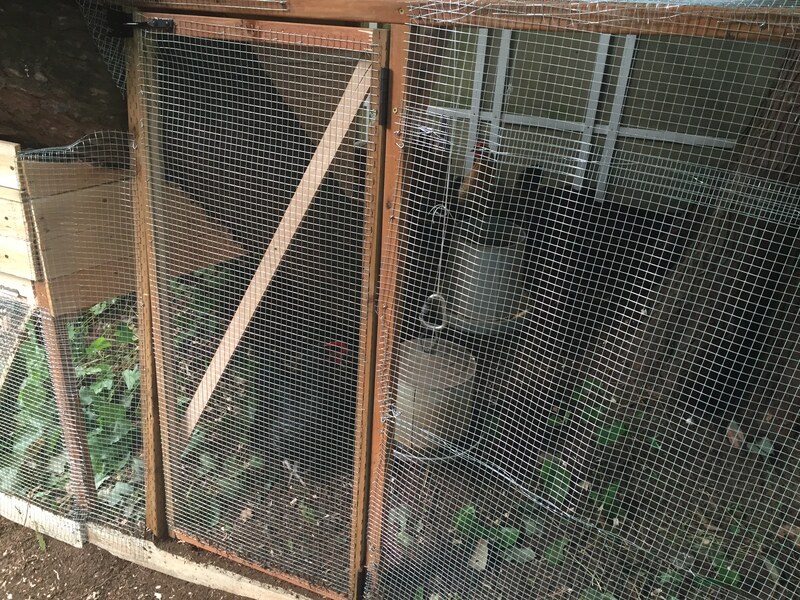 The right area would be the box for laying eggs; you want this to be dark and protected so the chickens think it’s a good spot. From there, I started framing the structure. 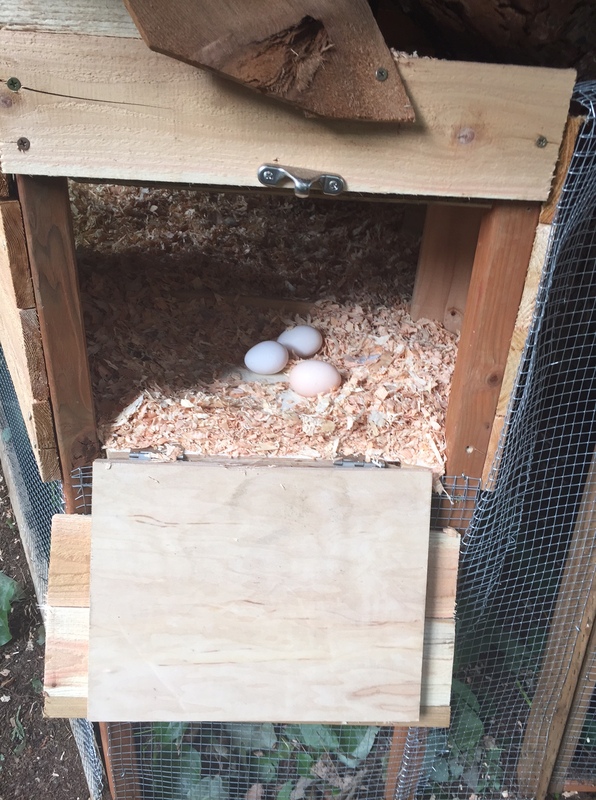 There would be one big swing-out door in the front for cleaning the coop, and a smaller door on the egg box for easy collection. The framing itself was done organically, simply attaching pieces of lumber as they seemed fitting. 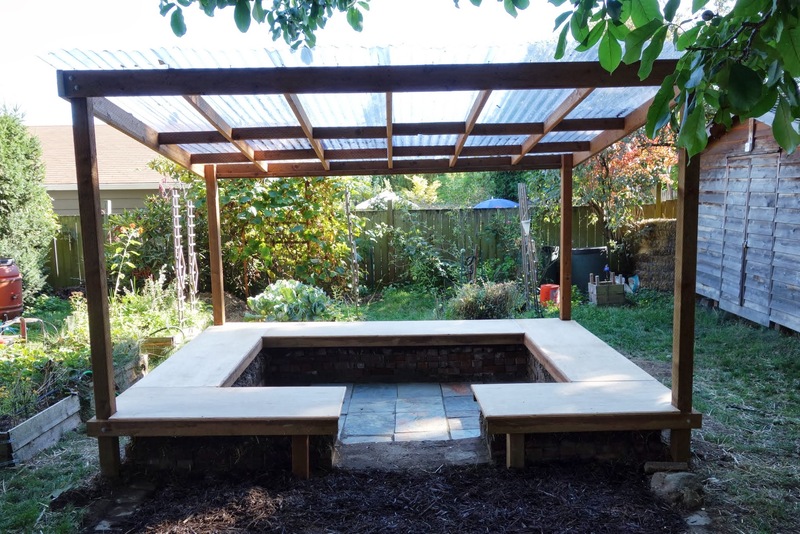 Once the framing was in place, I started attaching cedar boards to the sides. I got a pile of cedar shingles and tossed them on top. Certainly not a pretty job, with so many angles, but hopefully it came across as whimsical…? 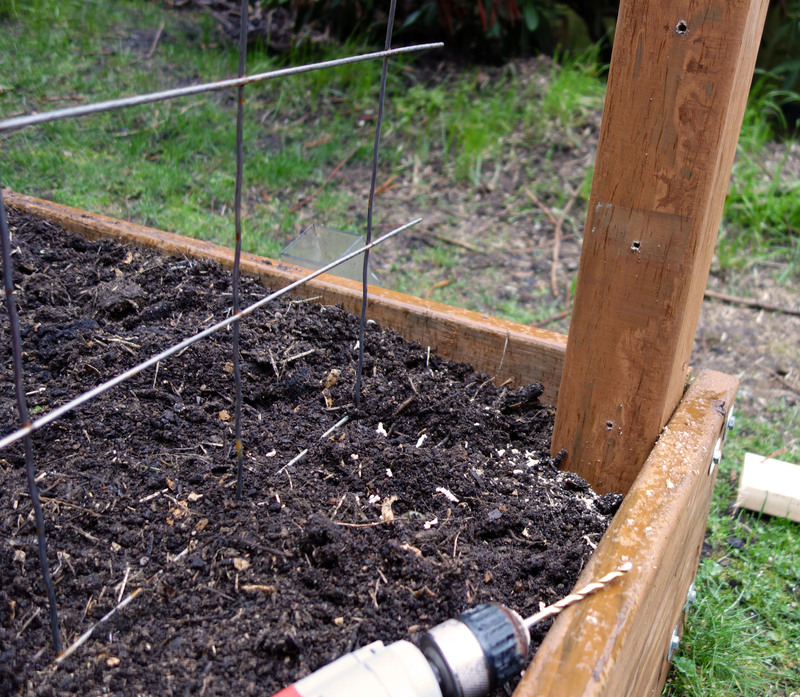 The last step was the enclose the entire area in 1/4″ mesh to keep raccoons out! The Ladies quickly set up residence and got to work laying eggs! We moved into a new house in April 2015. Our old house had a tiny dining area; this house has a huge dining room, and our previous table looked puny and weird in the space. We needed a new table! We started shopping around, and just couldn’t find a table that (a) was the right size, (b) wasn’t ugly, and (c) was not insanely expensive. I kept checking Craigslist, visited at least 10 furniture stores… nothing. Obviously, I needed to build a table. The standard height is 30″, and we wanted one which would be 8-10 feet long, and about 40″ wide – a really big table, in other words. Ideally, there would also be a matching bench on one side. The lumber dictates the project. I started by visiting two of my favorite salvage stores, Ballard Reuse and Earthwise Architectural Salvage. There was a lot of interesting stuff… we could use planks of sun-bleached beachwood. Or chunks of maple from a torn-up bowling alley. But I was most fascinated by the glued-together strips of 1.5″ wood that formed 16.5″ by 8′ planks, which came from old Boeing shipping crates. (I still don’t know how that worked, or what was being shipped. 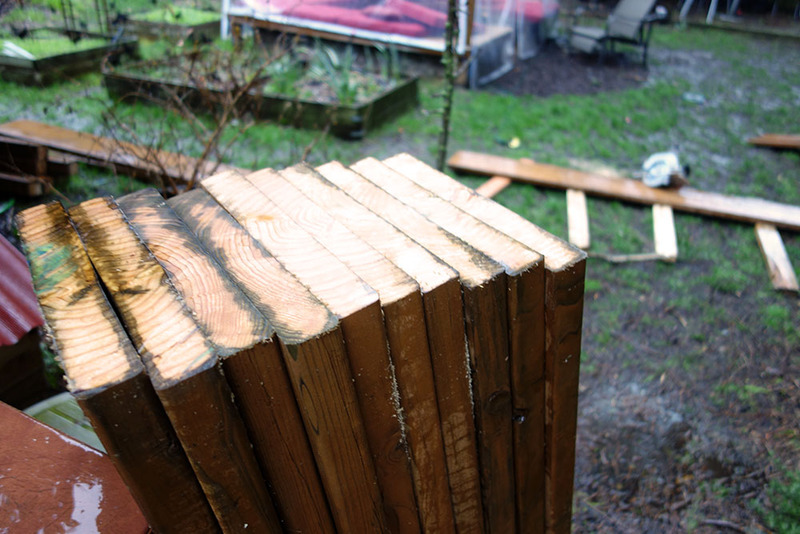 Actually, this lumber had arrived to the store in 16′ lengths, and was cut in half). Pretty cool stuff, all sorts of different woods and grains. 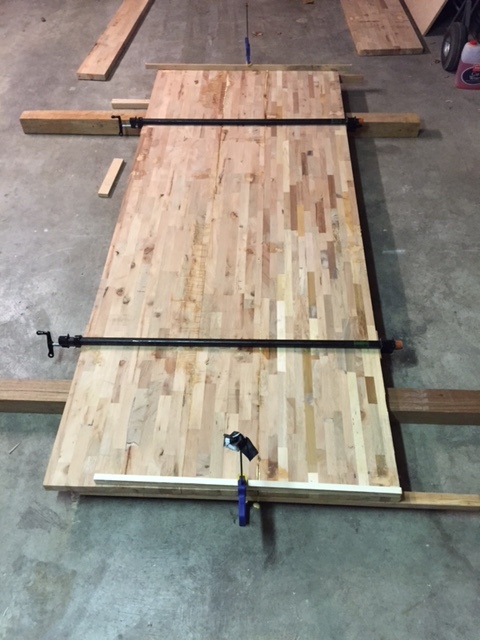 This would be the table top; and since it came in 8′ lengths, the table would be 8′ long! I would buy 4 of these pieces of lumber; three for the table top, and one for a bench. 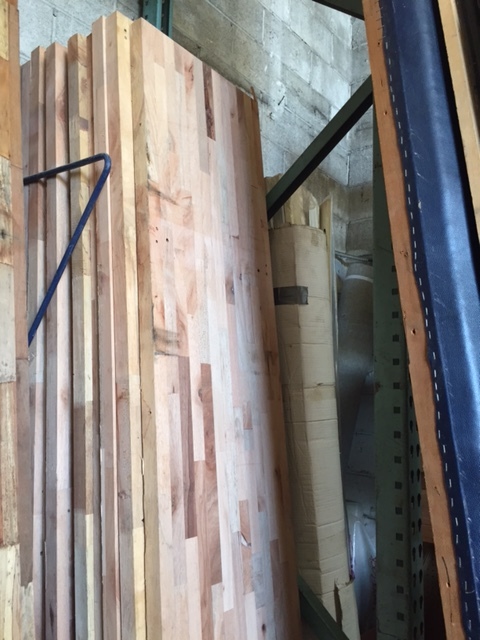 Poking around the back of the store, I came across some pretty unusual lumber; mahogany 4x4s and 3/4″ ipe wood. Ipe is a really hard, dark wood; and mahogany is solid and goreous. Turns out the mahogany was also from old Boeing shipping crates (WHAT WERE THEY DOING WITH THESE CRATES?) and the ipe was reclaimed from someone’s deck. 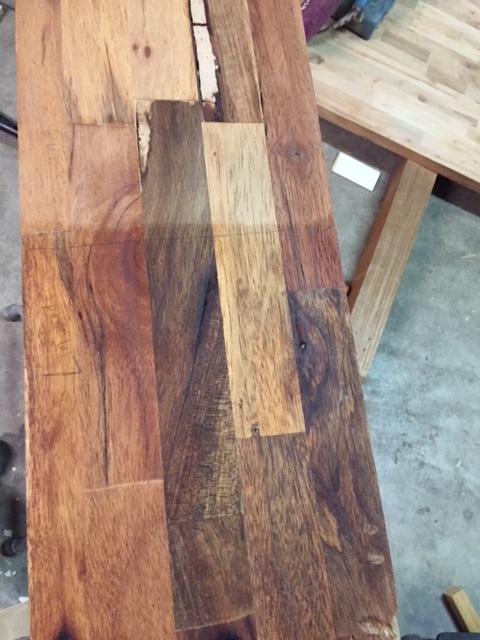 While I usually avoid buying tropical hardwoods on the grounds that they’re ecologically harmful, there’s nothing wrong with recycling lumber, so I figured I’d buy the mahogany for table legs, and use the ipe to edge the table. I rented a van and moved everything into the garage. 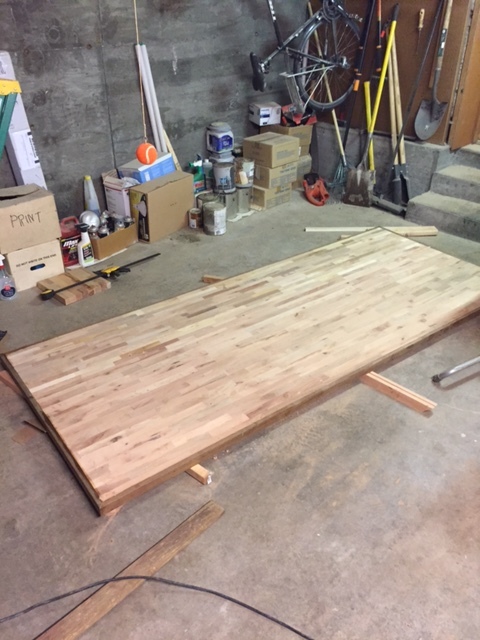 I wanted the table top to be 40″ wide, but the lumber was 16.5″ wide. I would use three pieces, ripping one down in the table saw to be 7″ wide. I was prepared to use all sorts of fancy ways to join the lumber – dowels, discs, keystones, etc. – but when I called my dad for advice, he pointed out that wood glue would work just fine. 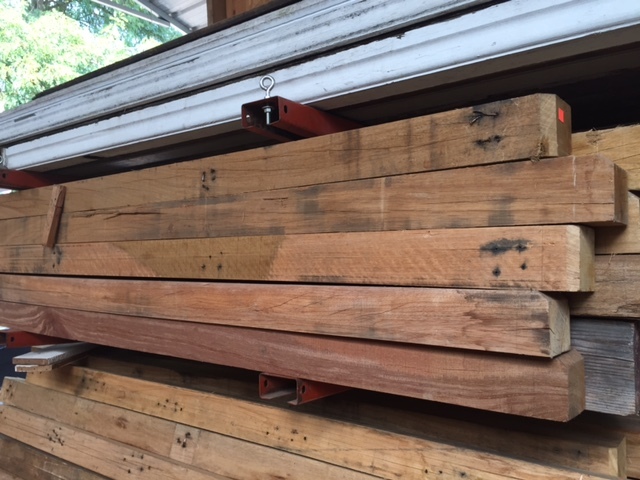 It forms a stronger bond than the wood itself, and this lumber wasn’t at risk for warping. And it’s a lot easier! So I slathered glue between the boards, and used pipe clamps to hold the whole mess together. Smaller clamps at the end kept the boards more-or-less even. I could definitely have used lots more clamps; you can never have enough clamps. While the glue was curing, I used a scrap piece of lumber to play with different stains – linseed oil, tung oil, and Varathane natural. Below is linseed (bottom) and tung (top); the Varathane is in-between in darkness. 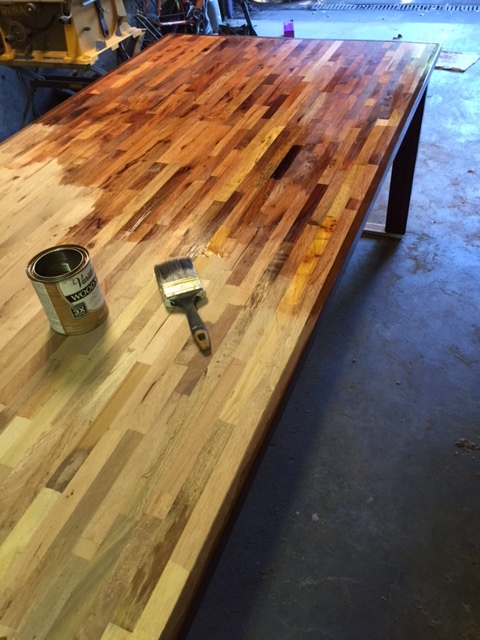 We ultimately decided on Varathane because it’s less of a pain to use, and the color was nice. Next, I cut the ipe wood to edge the table. 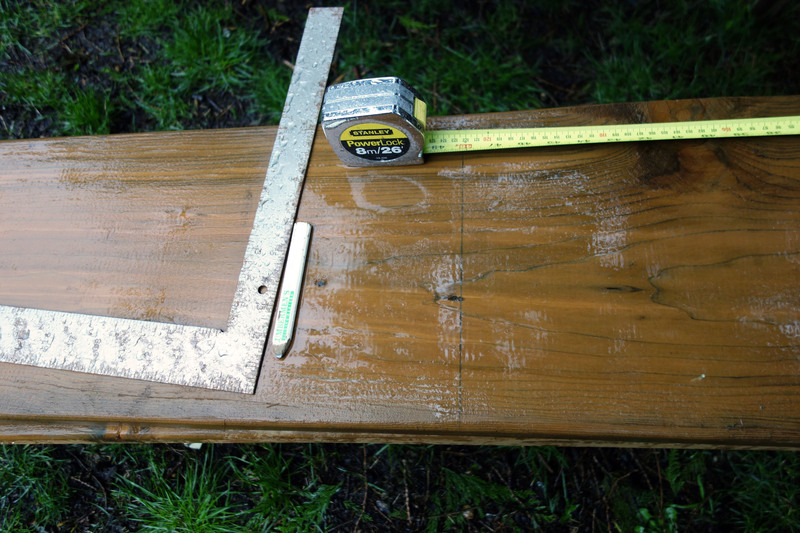 I ripped 6″ lumber down to 1.5″ width, and then cut the ends at 45 degree angles. Finally, I glued them the outside edge of the table. Ipe wood throws off ultra-fine dust which is rather noxious. I had to wear a face mask when working with it. 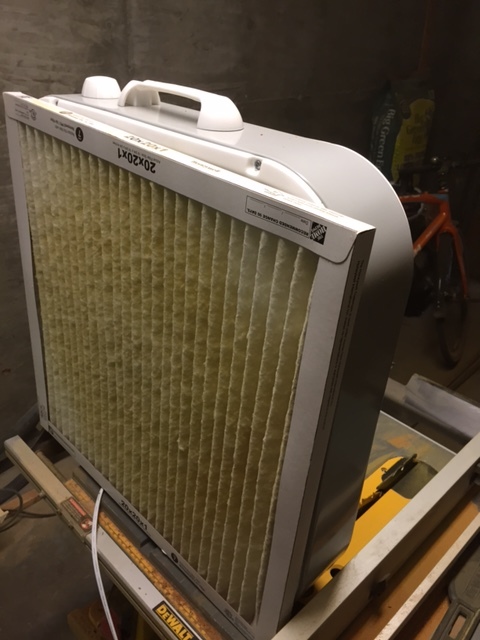 Since my garage doesn’t have an air filter system, I used the Poor Man’s Air filter, which is to place a 20″x20″ furnace filter in front of a box fan. This works shockingly well. 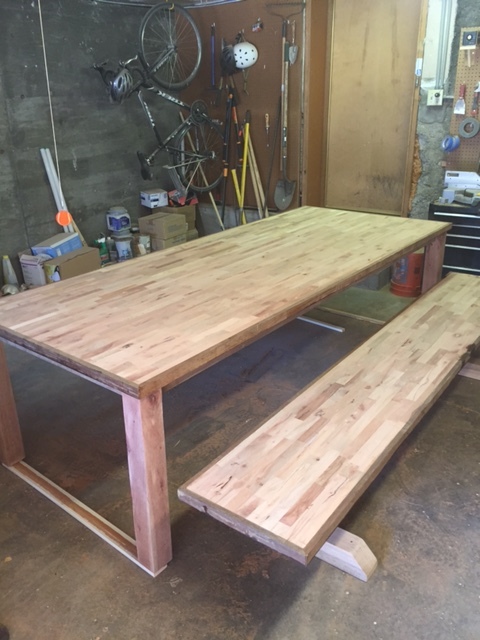 I repeated the same steps for the bench top. I was using full-width lumber, so I only needed to edge it with ipe, too. Now, it was time to do a first pass of sanding to remove bits of glue and uneven edges. 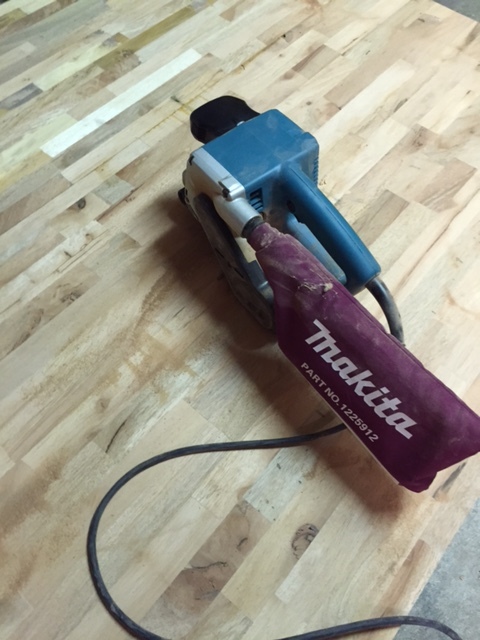 There was a LOT of area to sand, so I used the belt sander. Now that the tops were pretty much done, I turned my attention to the legs. I was going to attach mahagony 4×4 legs to the corners of the table, with 3.5″ ipe wood to as a skirt that would attach to the legs. This skirt would both give the table a bit of help to prevent sag, and also would be embedded into the legs to give them some strength to stay vertical and not wobble. 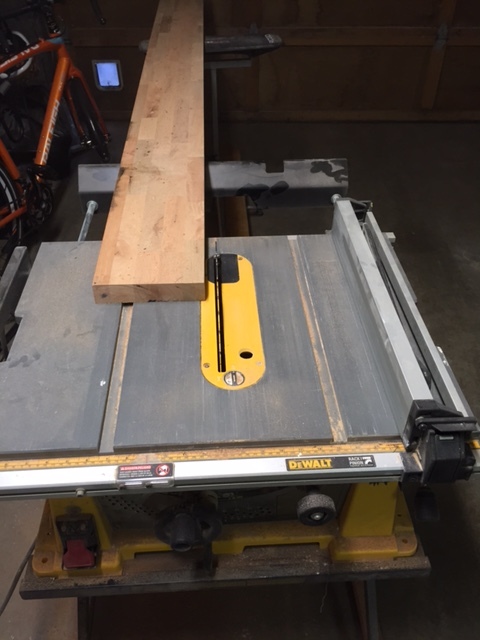 I used a router to cut 3/4″ wide, 3.5″ long channels into the mahogony legs. 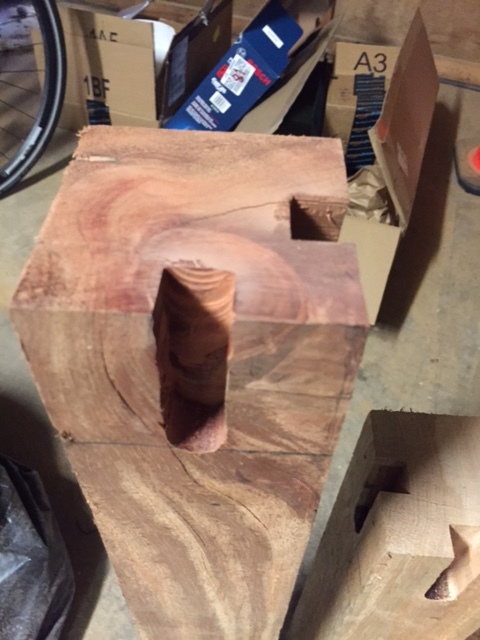 This turned out to be much harder than I had thought, since the router bit kept overheating as it dug into this very hard wood. Required a lot of starts, stops, swearing and occasional chiseling. I did also drill a 1/2″ wide hole into the middle of each leg, so I could use a dowel in addition to glue to secure the leg to the table. 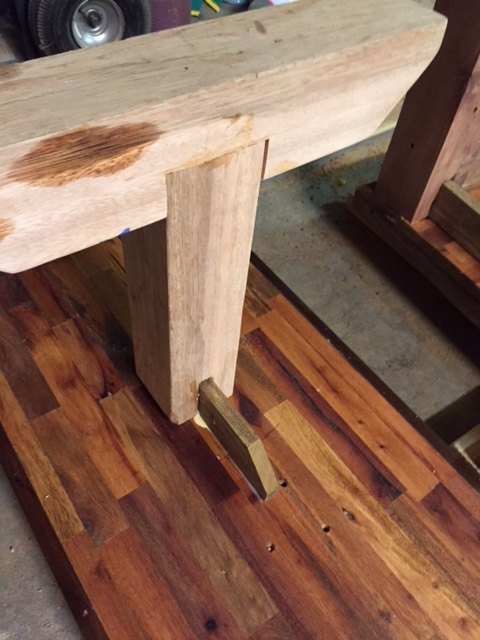 Once I had the dowels, legs with grooves, and ipe in place, it was matter of assembling the whole puzzle to the bottom of the table. For the bench, I used a similar technique to attach the legs to the top of the bench. 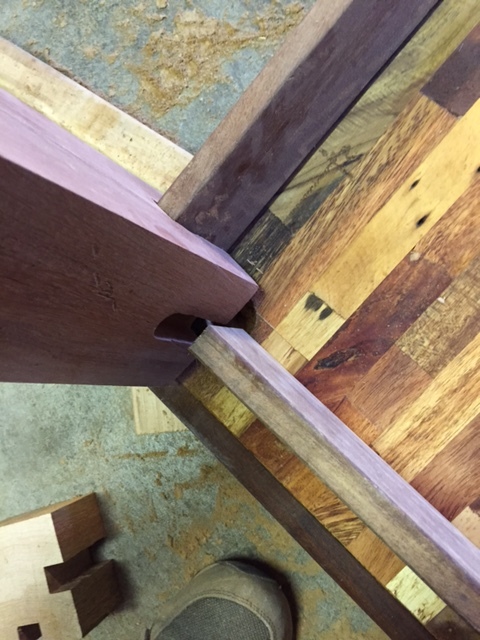 For the bottom of the legs, I used another piece of mahogany which had a groove cut into it to hold the leg. To cut the groove, I just did lots of passes with a skill saw followed by chiseling to clean-up. Once the glue holding the legs had dried, I flipped the bench and table, and had something close to the final product! 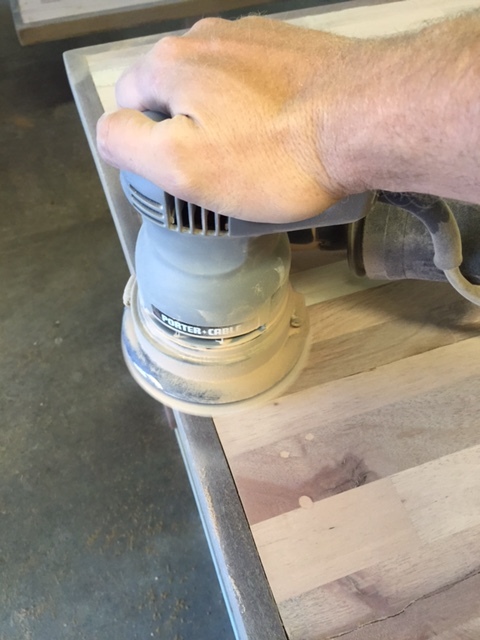 But then: sanding. So much sanding. 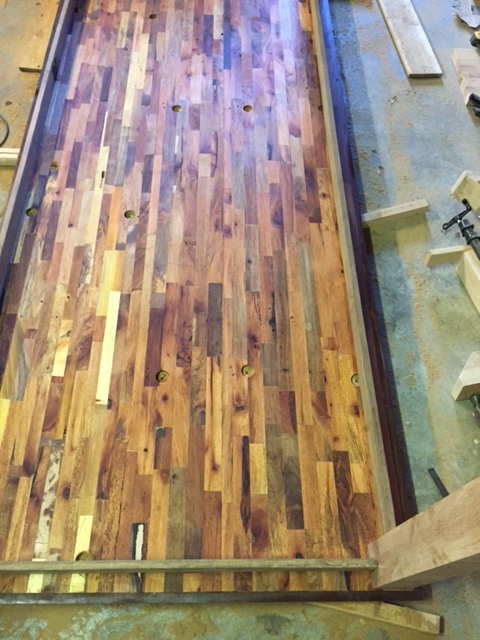 80 grit, then 120, then 220 over about 38 square feet. Once the sanding was done, the rest was pretty easy – all I had to do was stain and then apply multiple coats of polyurethane (over the course of several days). 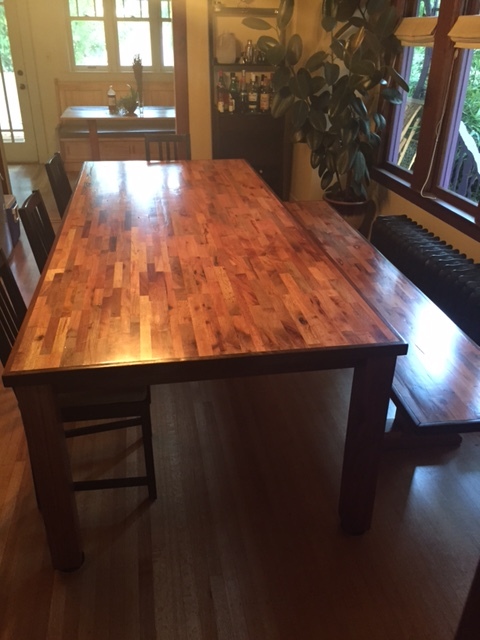 Finally, the table was done! My good friend Wayne helped me carry the heavy – but not impossibly so! – table around the front of the house and into the dining room. No matter how many windows were opened, it was too hot in the summer. 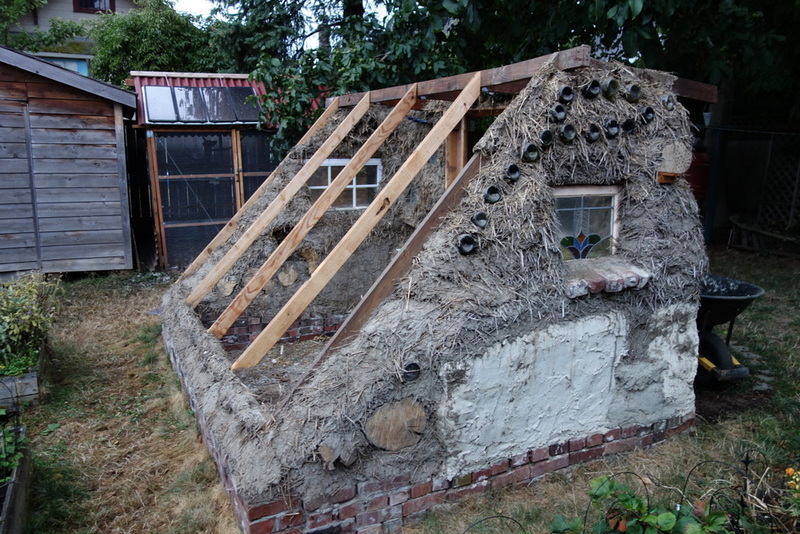 Cob has tremendous thermal mass. Plants would cook in there; so we mostly used it for spring starts and storage. 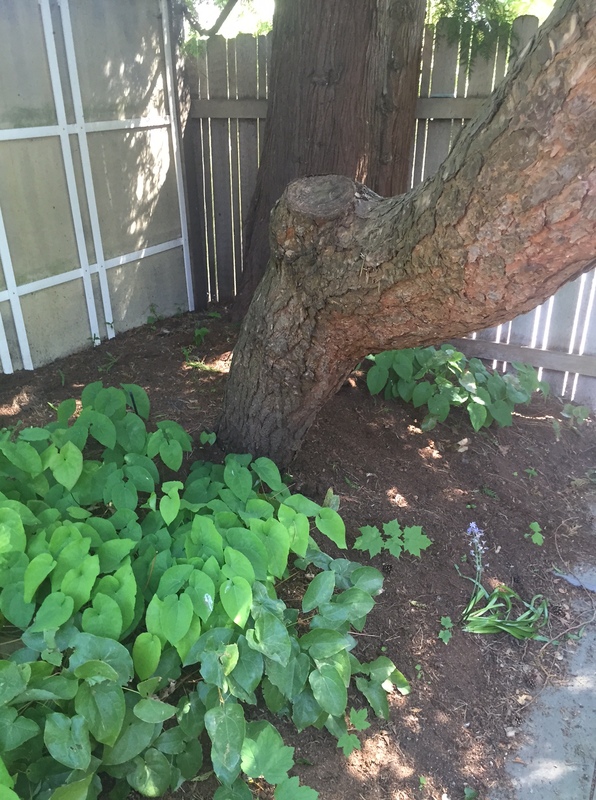 It took up a lot of room in the yard, which cut down on space to gather with friends. 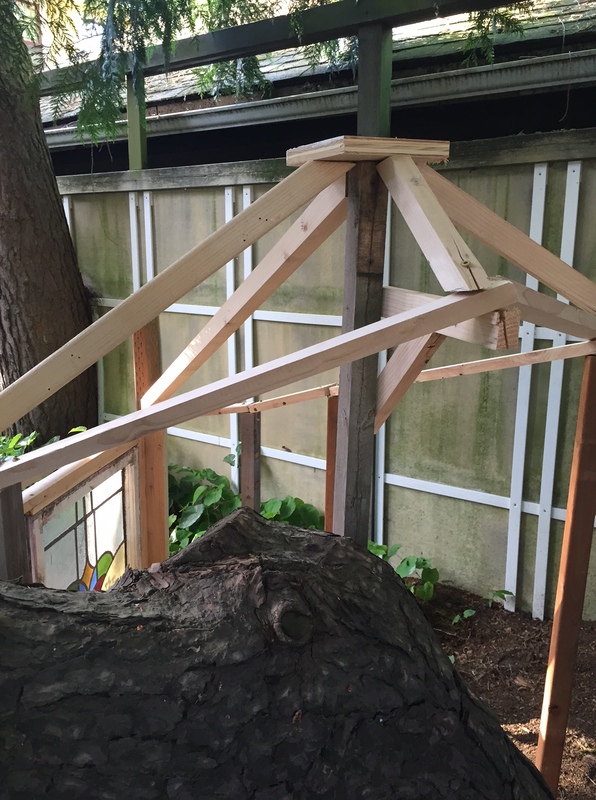 I needed a bit of extra lumber to frame the new structure – in particular, 14-foot 2×6 cross-beams, and 4×4 posts. The rest of the wood was salvaged. 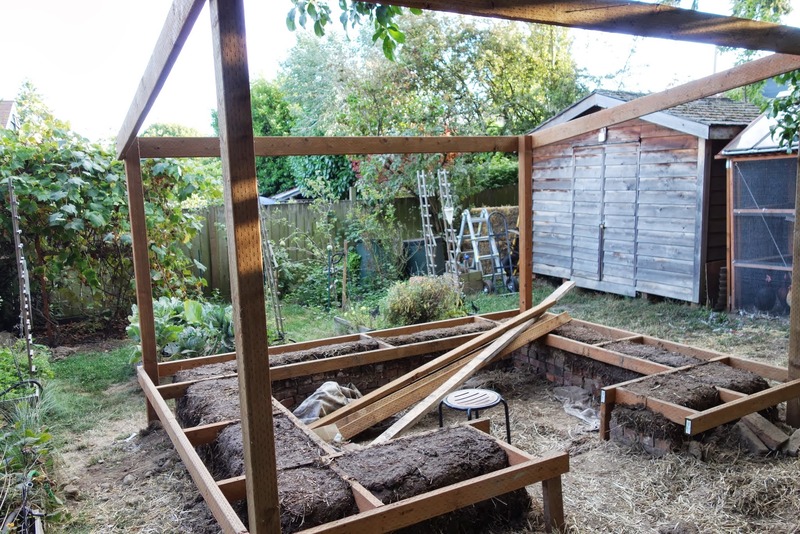 Thus supplied, I began the process of deconstructing the cob greenhouse. 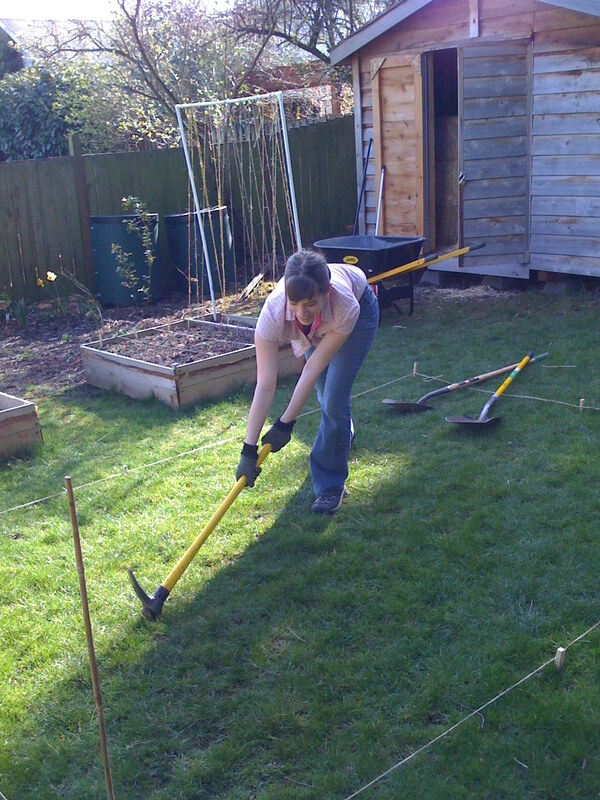 Halfway through, I took a break to dig postholes at the outside-corners. I cut and positioned the 4×4 posts, such that the northern posts were 8′ tall and the southern posts were 6.5′ tall (from ground level). I temporarily screwed cross-beams on to ensure the correct sizing and square form. 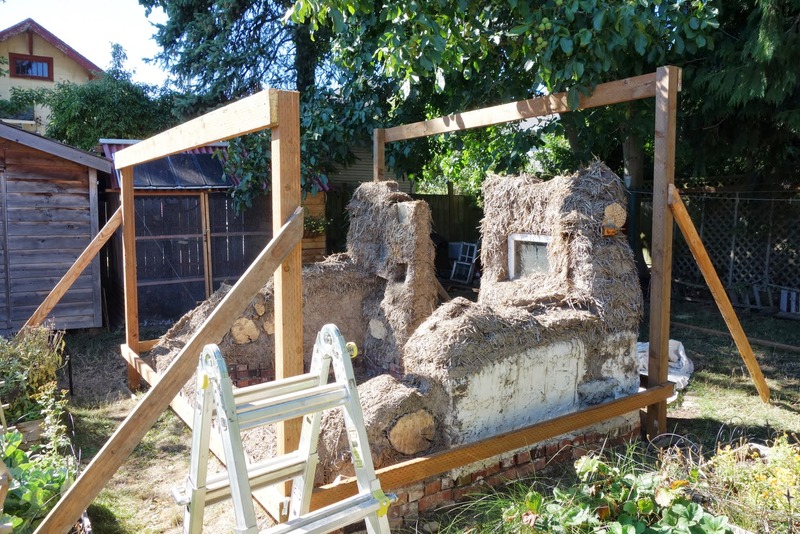 From there, it was a matter of removing the rest of the cob (and strawbales) to a level about 18″ above ground level, and finalizing the framing. My plan was to keep cob as the interior foundation, such that it would still be covered and protected from rain. 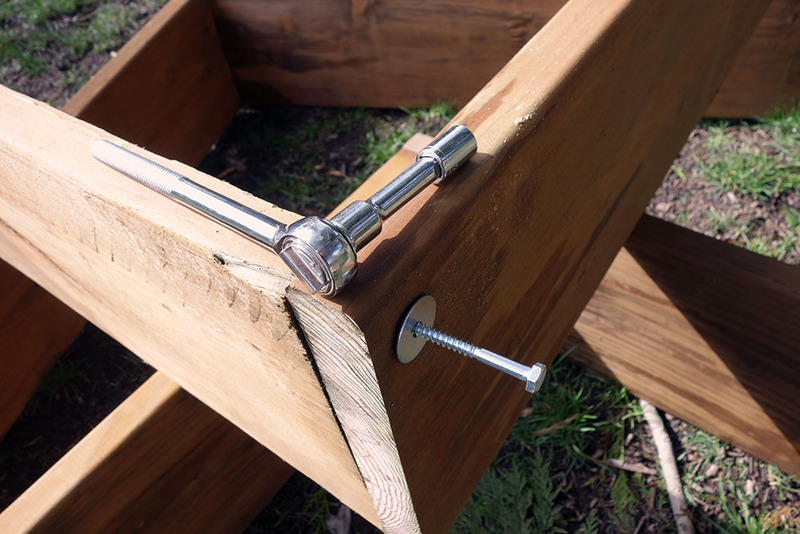 Lumber was attached the 4×4 posts with hefty lag screws. 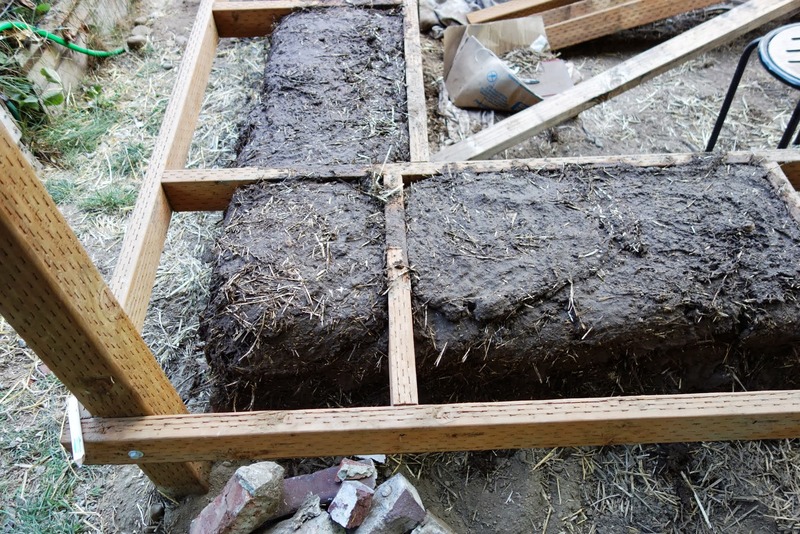 I then framed the interior parts that would become the 24″-wide benches with 2x4s, embedded in cob. The cob was easy to re-shape; just add a bit of water and squish into the new form! From there, a simple matter of adding the roof, which came from the original greenhous Almost done! 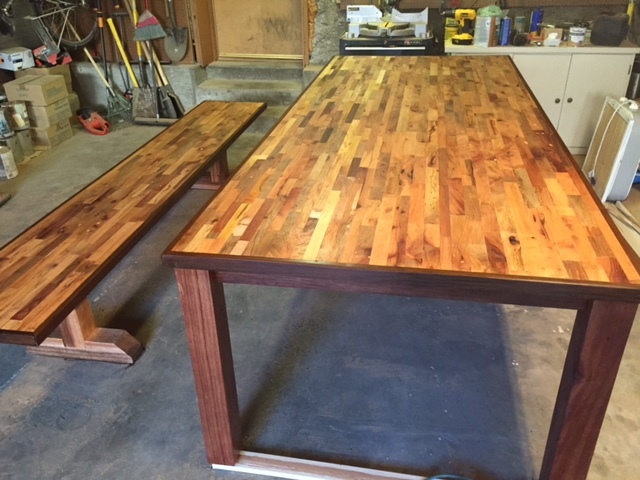 I just needed to cut 3/4″ plywood to make the benches. 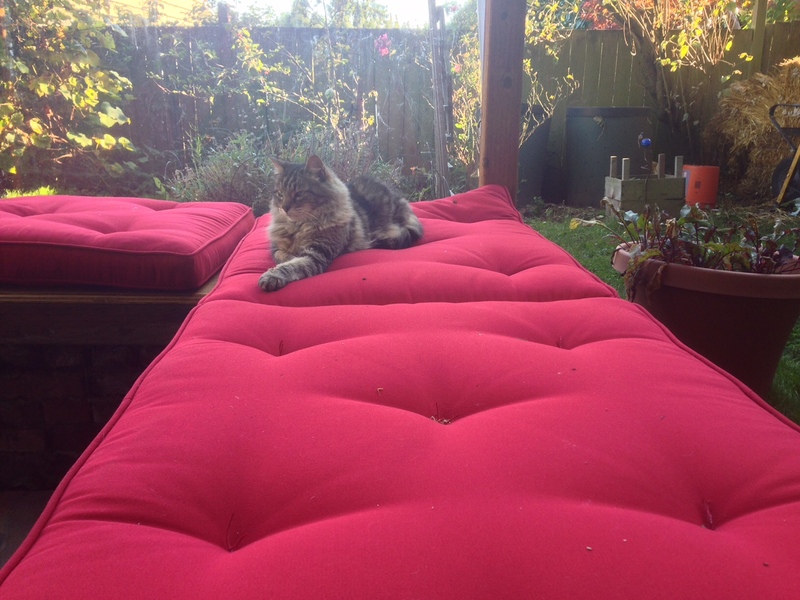 …caulking cracks, giving the wood many coats of oil-based polyurethane, and then buying some cushions (which were promptly claimed by the cat). The pagoda is a great hit for parties – we fit about 14 people at one point. We eventually even added clear plastic walls, ran power out there, and had a projector for watching movies. Party central! 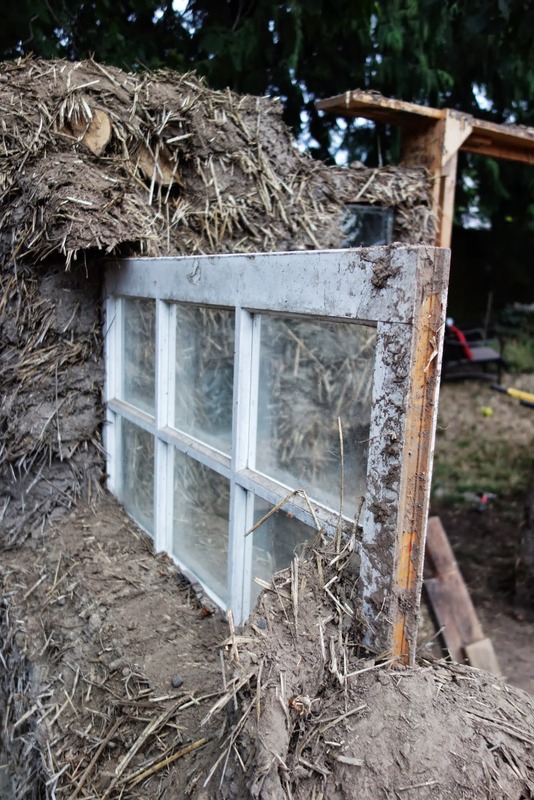 Dirt plus straw plus water hardens into a mass which can bear significant load, and lasts for years – provided you keep it dry. I was first exposed to Cob when I was spending half a year at Pendle Hill, a Quaker retreat center in Pennsylvania. I had taken a bit of time off from college to regroup, find my spiritual center, and awaken my spirituality. As it turns out, I’m an atheist with little patience for sitting around; the self-discoveries of youth can be equal parts profound and confounding. 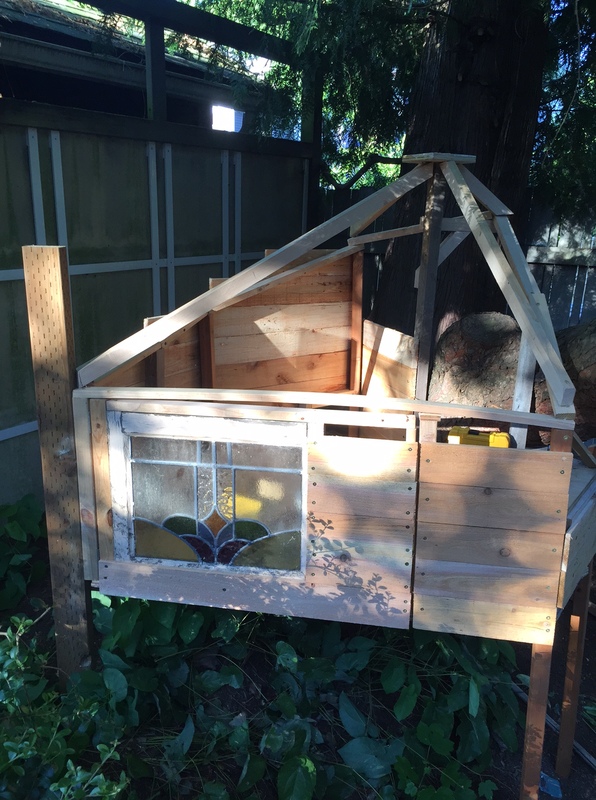 In search of things to keep my mind off my mind, I stumbled upon a nascent project to build a greenhouse out of sustainable and local materials, including trees from the property, large stones, and the aforementioned cob. The trees were stripped of bark, and sealed with linseed oil (which, as it turns out, isn’t sufficient; they eventually fell victim to termites). The stones were horribly heavy (surprise!) and took amazingly long to assemble into a workable foundation. But cob – oh cob! – was a great discovery. 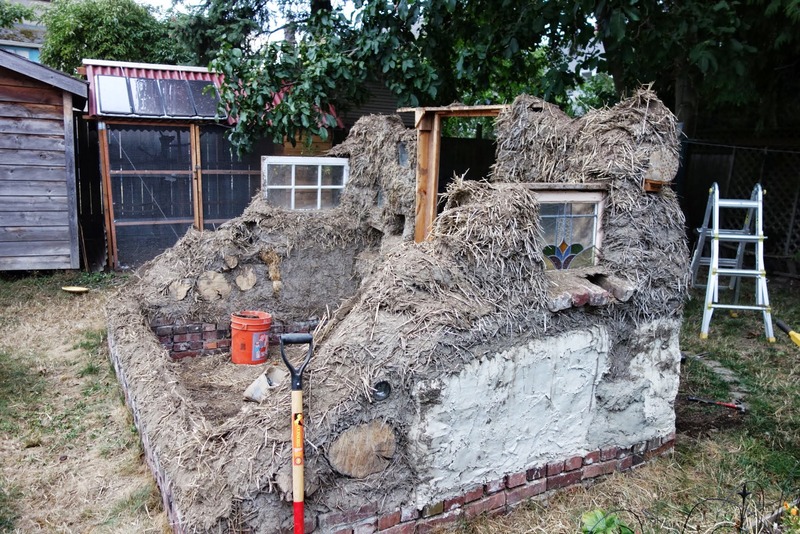 Wait for the cob to dry (1-3 days, depending on the weather) before applying the next layer. If it rains, be sure to cover your cob! It’s slow, steady, muddy work. But slowly, walls emerge. Not the perfectly flat grid-walls of modern times; these are curvy, organic, emergent forms. 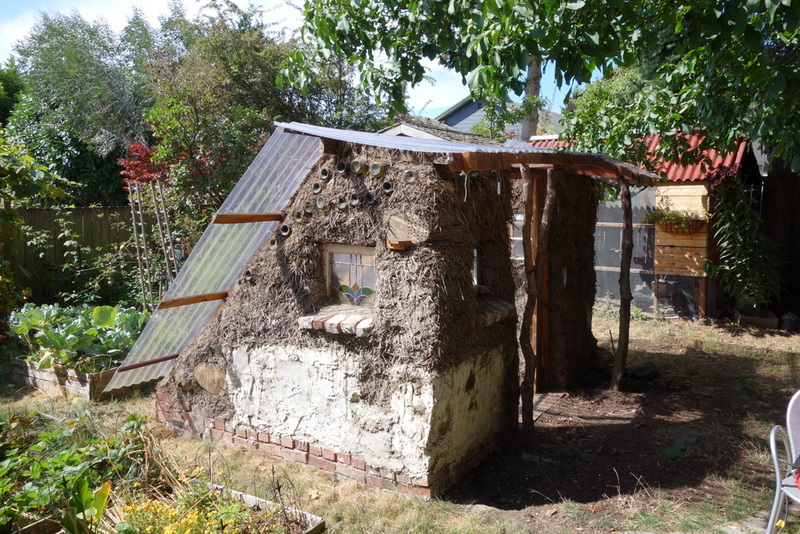 Surprisingly, cob hardens to an almost concrete-like form; sure, you can rub dirt off the walls, but it’s resilient and solid. Years later, we had a house. And a boring lawn. But no greenhouse. 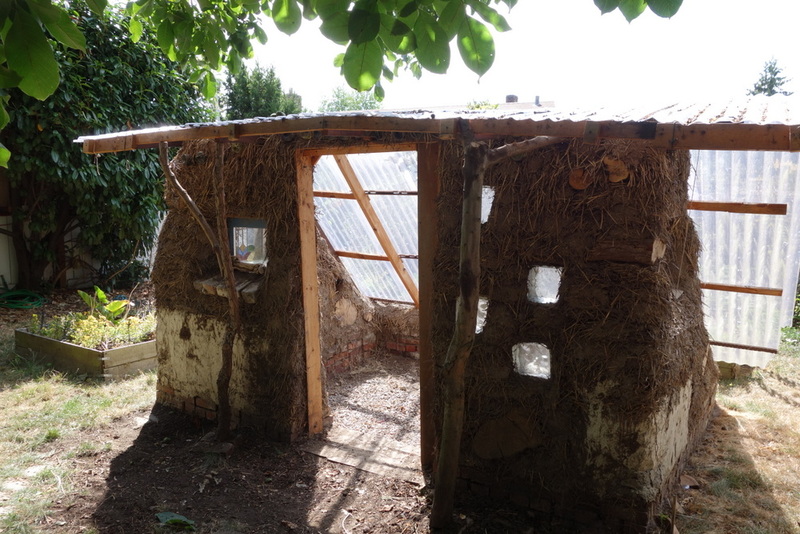 It was time to build a cob greenhouse of our own. 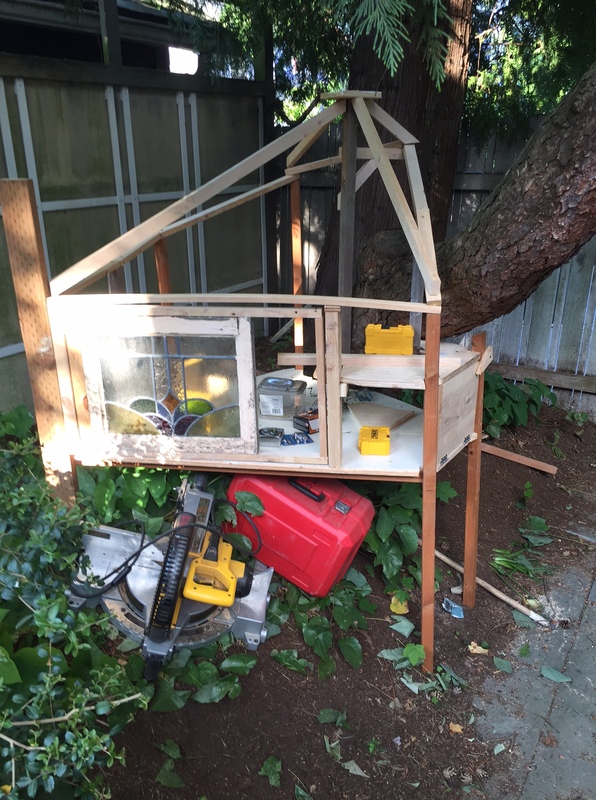 I started my measuring out a 9′ by 14′ area. 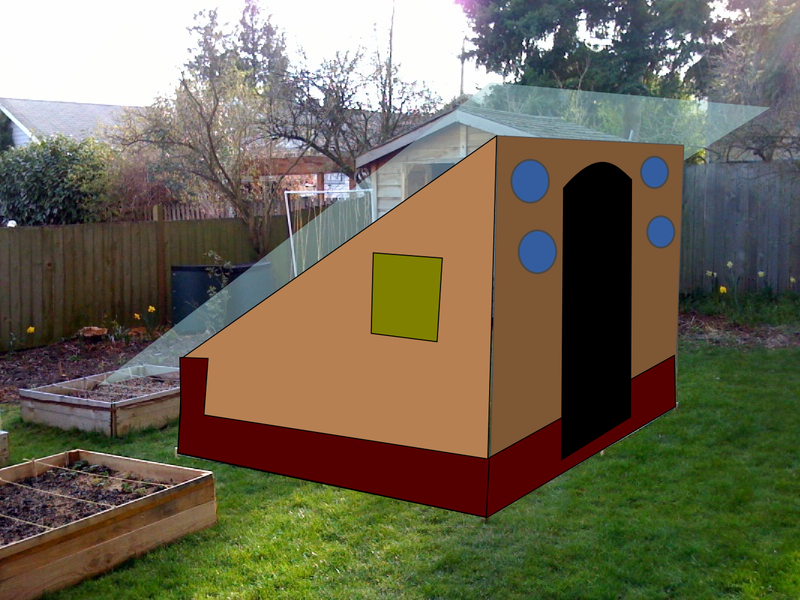 I took a photo, and (crudely) used Google SketchUp to make a 3-D rough model of my vision. Single sloped roof, from about 2 feet above the ground on the south wall to 7 feet above ground on the north (biggest) wall. 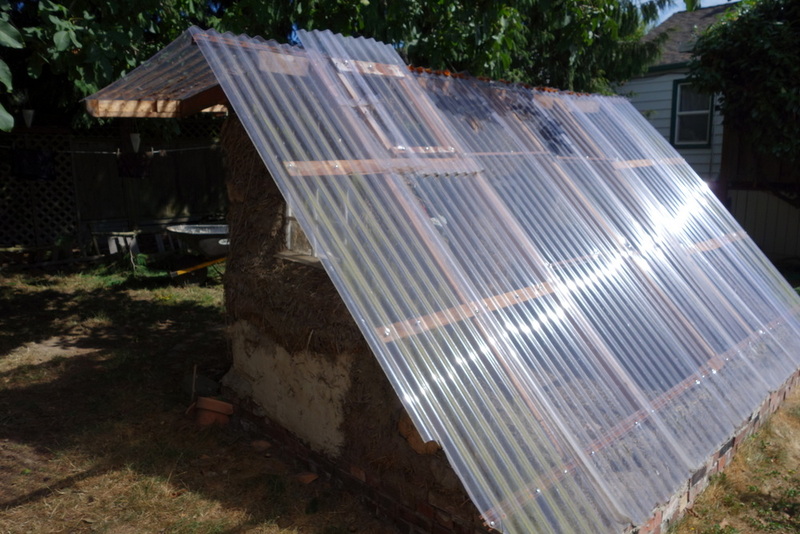 The roof is made from clear plastic. There would be a door on the north wall. This also requires less cob. Include windows on the East and West walls (maybe the North Wall too). We were ready to dig out the foundation! This would both put the walls a bit underground, but – as it turns out, more importantly! 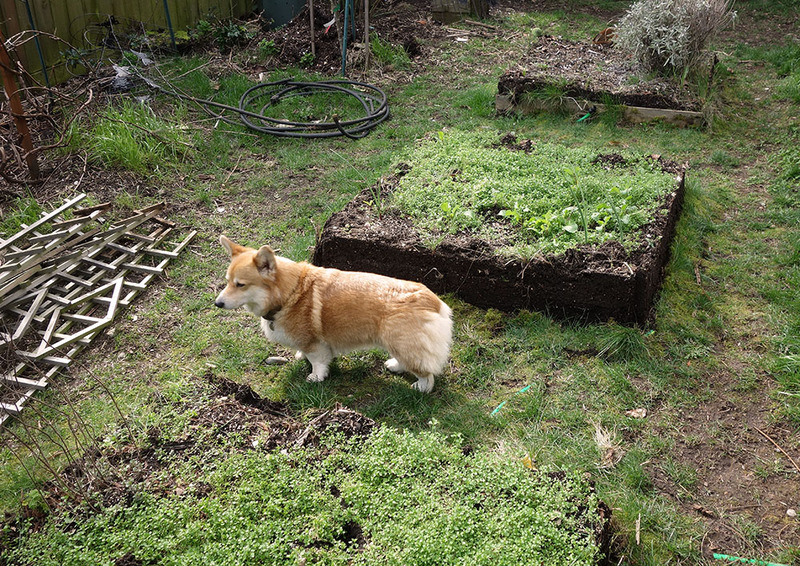 – gave us a few mounds of dirt to turn into cob. I mean, they look great. But even the smallest wall has a TON of bricks. And while I could’ve started with new bricks, I wanted to save money and have nice-looking, worn, interesting bricks. So I started bargain-hunting on Craigslist for bricks, hauling load after load to the house. All things told, I certainly didn’t save money compared to just ordering a delivery of new bricks – and it took a lot of time and sore muscles. But finally, we had enough bricks. We laid the first layer of bricks out, and pounded rebar in-between, so it would stick up high into the wall. 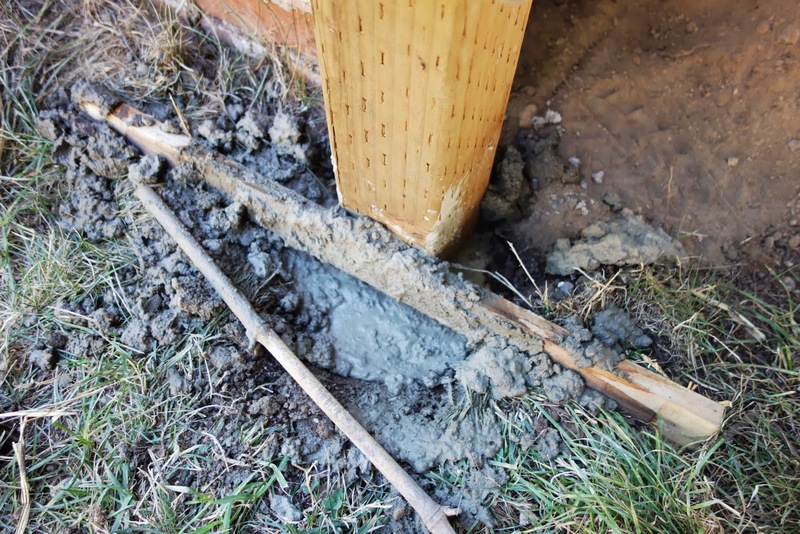 From there, we mortared layer after layer of brick to make a foundation, leaving an opening for the door. Sadly, I have hardly any photos of the building process. I had completely underestimated just how much dirt we would need; we quickly emptied our yard of its hills, and introduced new depressions. Towards the end, we became perhaps overzealous in our use of recycling materials for construction purposes, in order to take up room. Several hated hawtorne tree stumps made their way into the building, too. From the nearby, wonderful re-purposer of materials, Re-Store, I was able to get recycled lumber, and a door. Lisa rescued a stained glass mirror from the trash which was also incorporated. We put on the finishing touches, and attached the roof plastic. And then… we were done! Not too far from the original mockup, am I right? Cob also has tremendous thermal mass. As we learned, the greenhouse would get murderously hot in the summer under almost kind of sun. I installed an automatic vent which would lift a big section of the roof when it got hot; the vent was almost always open. (Automatic vents are neat, by the way; a cylinder of stuff (wax?) expands under heat, and pushes open a window just based on the pressure in the cylinder). 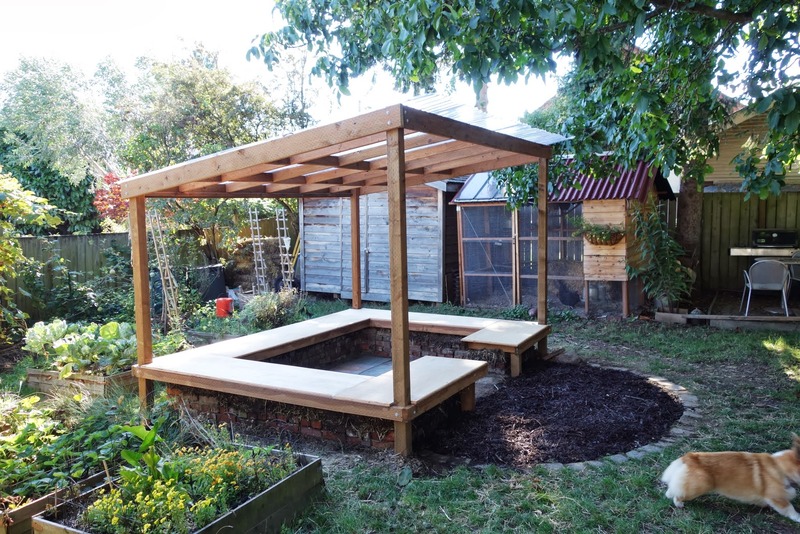 Even so, it was too warm; the greenhouse became useful for extending the growing season in the spring through late in the fall by moving plants in-and-out. When I was a teenager, I published a video game. It even got a bit of distribution in the kind of free CD-ROMs you used to find tucked into enthusiast magazines. A few people emailed me. Then, I kind of forgot about it. One of my servers recently died. As I was cleaning it up and copying over the important bits, I found the old code archives for this game – and I paused to give it a look, not unlike the way you’d flip through a photo album you found while cleaning out a closet. The thing is, the game was pretty good. While I’m not exactly proud of the code, it’s nowhere near as badly written or organized as I thought. I’d written gobs of documentation. 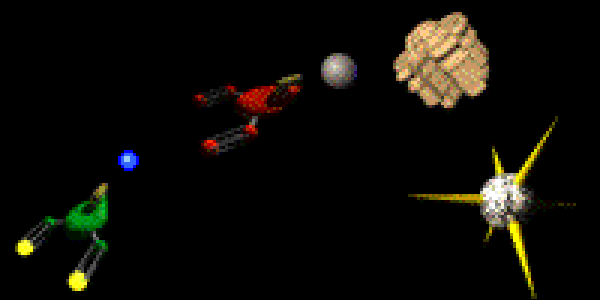 The game design was unique, and the graphics were good (but by modern standards, very tiny; I was designing for a 640×480 screen). I didn’t even know that open source was a thing at the time; I’d released the game as vaguely-worded “freeware” and posted links to the code. (It’s now GPL). Spiked is 17 years old. It was written for the old MacOS (pre MacOS X). It requires two people to sit down and compete using the same keyboard. But it’s a thing I made, finished, and published – and that’s pretty cool. The least I can do is give it a small breath of life and write about it; and post the source code on GitHub where it will be (somewhat) immune to bitrot. In honor of my younger self, I give you part of the original Spiked documentation I wrote in 1997. Spiked 2.1 is a two-player arcade game of cunning, physics, and brute force. One player pilots a green ship, the other player a red ship. There is a horrible, nasty spike that floats around the screen (hence the name of the game, eh?) The only way to die is to touch the horribly, nasty spike. The game follows the gladiator paradigm: the player who walks away alive, wins. So, spike your opponent and achieve victory. Each player starts with three lives. A match lasts between 1-5 minutes, about the attention span of your average computer game player. The game plays in a straightforward fashion. The players, the spike, and other items are dumped into a closed arena. Everything interacts with everything else according to the laws of physics. If you bump into your opponent, he/she WILL fly backwards. You can even move the spike if you shove it hard enough (of course, it has 200 times the mass of a player, so it can take a while to build up its momentum). A simple strategy would be to get your opponent between you and the spike, and then you accelerate towards your opponent to shove him/her into the spike. Unfortunately, your clever opponent will probably just move and you will find yourself kissing the spike, which is bad for your health. Lots of other things float about the arena. Rocks are massive and basically just get in the way. Ram them to move them. Once in a while, a rift in space opens and deposits either a new rock or a gift. Gifts make Spiked interesting. These little packets ‘o goodness just float around, waiting to be picked up before they either blow up or are pushed off the edge of the screen. Inside the gift you will find a useful item which can be used to either attack your opponent or get yourself out of a scrape. Bullets. Each ship is equipped with a small cannon that shoots bullets a short distance. You have infinite bullets, but all they do is push things out of the way. Bullets also destroy gifts, and rocks if you hit ’em enough. Cannonball. This item is really cool. It moves very quickly and shoves things aside. Try blasting your opponent into a spike with one of these! Cannonballs are also a great way to eliminate annoying rocks. Twister. This nasty item prevents whatever object it hits from accelerating. When you hit your opponent with a twister, a energy field clogs their engines, leaving them helpless . Take advantage of them and gently nudge them into a spike. Another use of twisters is to stop gifts which would otherwise float away. Gravitron. Be careful with this toy. You shoot forth a tremendous ³lasso² that drags whatever it hits towards you. This can be really cool if you attach the gravitron to your opponent so that they are dragged into a spike. Of course, if you attach a gravitron to a spike, then the spike will start chasing you and you will probably die. Pity. Speeder. When you invoke a speeder, you rocket forward in whatever direction you are pointed. This provides you with a way to hammer your opponent or to escape. Rockyspiker. If this hits a rock then the rock turns into a rockyspike; or, if it hits a rockyspike, the rockyspike turns back into a rock. A rockyspike is like a spike in that it kills things, but is has far less mass and the rockyspike will blow up if it hits the real spike. So there you have it. 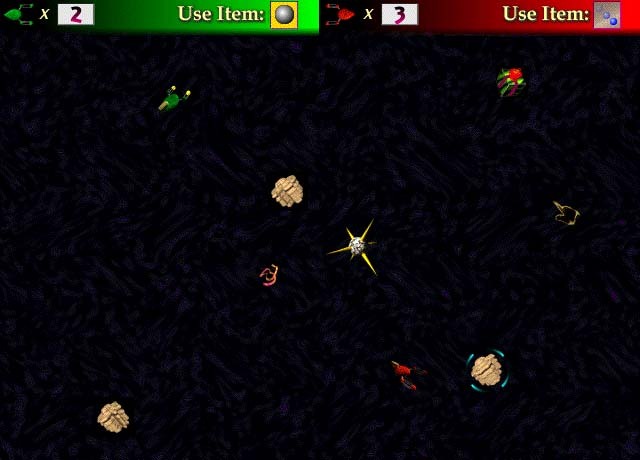 A 2-player game where the strategy is to manipulate an environment using the physics of randomly presented items. It was written in C++, painstakingly animated frame-by-frame to plug into a 2-d sprite library for which I simulated all the physics, for a now-defunct operating system. Not bad, much-younger-me. I need to live up to your example. 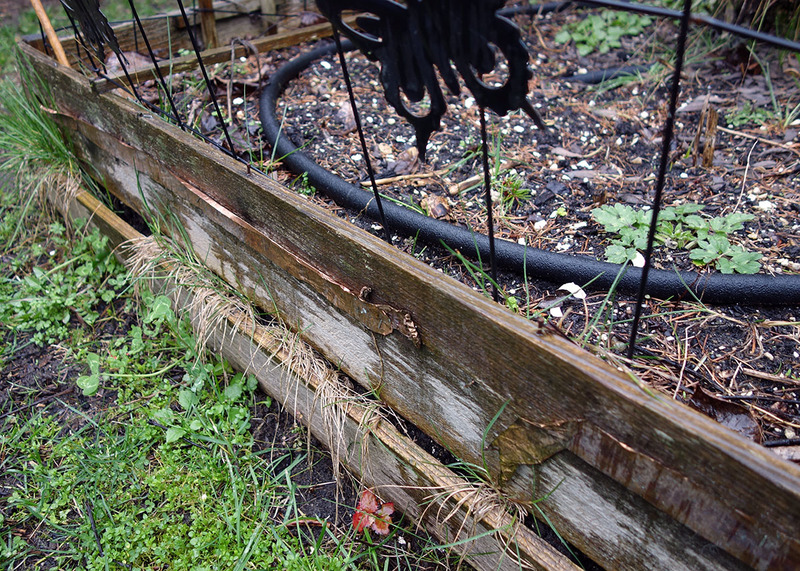 My old garden boxes were falling apart; they’d been made from 3/4″ cedar boards that were woefully unable to withstand the abuses of the elements. The size and location of the old boxes was good, though. There were three 4′ x 4′ boxes, and one 4′ by 8′ box (really, two sub-boxes). 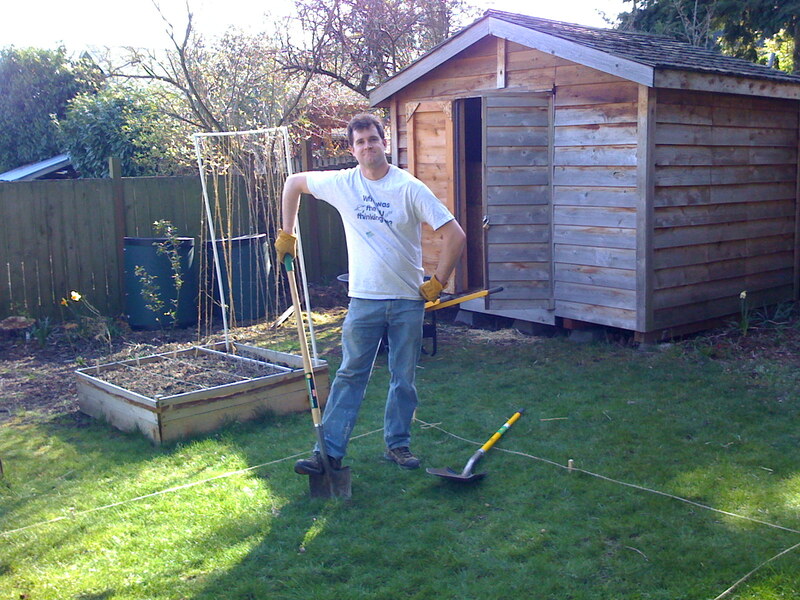 4′ wide is a good size; you can bend over to weed and reach plants easily, and also lumber tends to come in 4′ increments. I already had pretty good, loose soil in place. 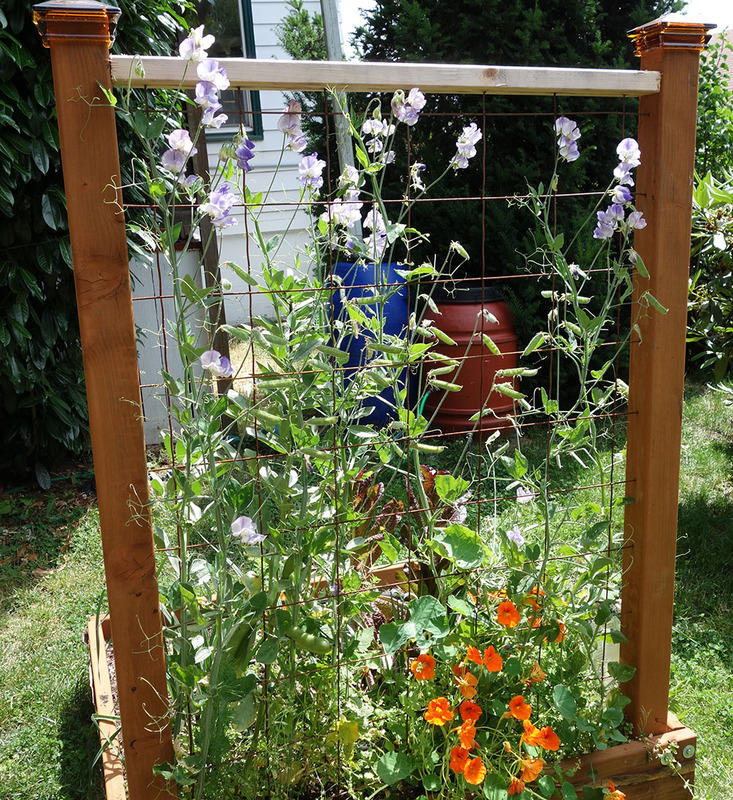 Also, it had worked well having a built-in trellis for climbing plants like peas and beans. These were positioned on the southwest edge of the boxes so that, in summer when they were covered in a wall of greenery, they wouldn’t shade out the rest of the box. The last thing that had worked decently well was the strip of copper tape around the perimeter of the box. Slugs and snails don’t like to touch copper. However, the tape had frayed at parts; and as the boards separated, slugs were now able to creep between the cracks in the boards. Fortunately, removing the old boxes was easy because the wood was in such terrible condition. 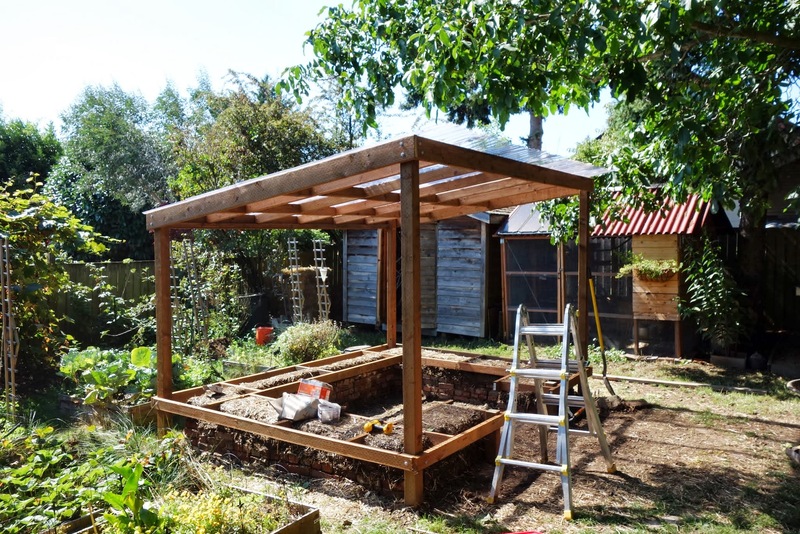 My plan was to replace the old boxes in-place with new boxes constructed out of sturdier 2×12 lumber; and with sturdier 4×4 posts in the northwest side for a new trellis. I’d use lag screws to stitch things together (bolts would have been stronger and preferable, but would have taken a bit more effort). 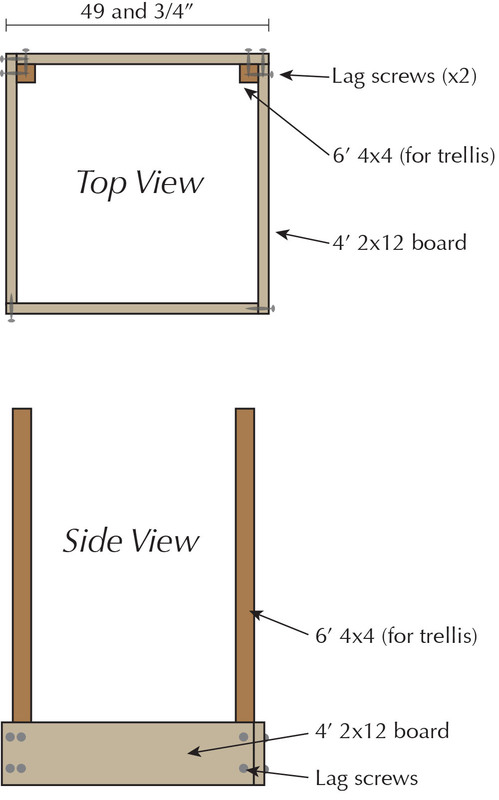 I would combine 4′ lengths of 2×12 boards such that, for each board, one end would cap another board; and the other end would be capped. This gives a square shape that’s the size of a 4′ board plus the the width of a 2×12 (because 2x12s are actually 1 3/4″ wide, the total width is 49 3/4″). In terms of lumber, I decided to use pressure treated fir. Cedar, which is naturally rot-resistant and good-looking, would have been preferable; but it’s significantly more expensive. Pressure-treating helps prevent rot; while I had some reservations about the chemicals used, the lumber yard I use (Dunn lumber) advertises that these boards are safe for people, pets, and plants. 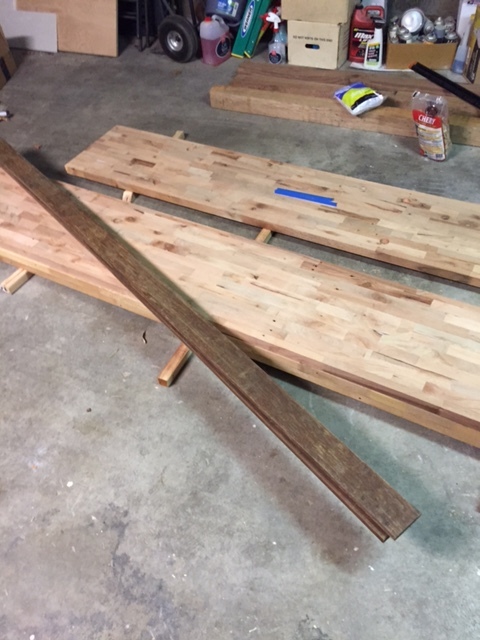 I decided it would be most economical to buy 8′ lengths of 2×12, and cut them in half to give two 4′ lengths. 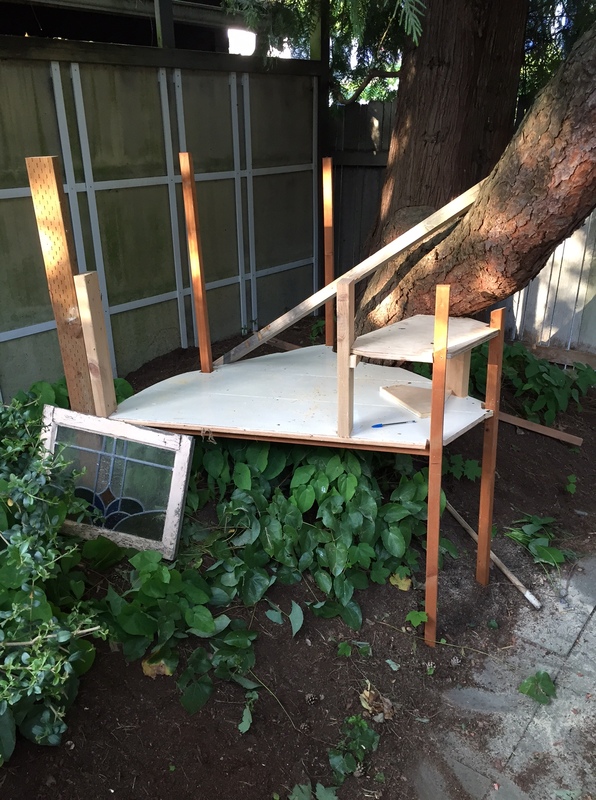 (Also, note that pressure treated lumber is quite heavy; 12′ would have worked too, but is an awkward size and mass to maneuver). 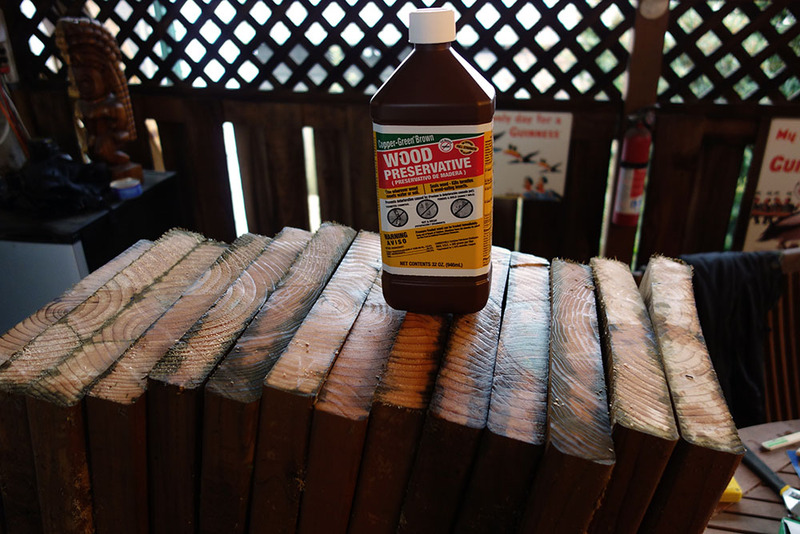 Because the pressure treated chemicals are only on the outside the wood, when you cut pressure treated lumber, you should coat the end of the cut with chemicals to preserve the wood. Those chemicals are not to be trusted, and so I would have to be careful to have the cut ends pointing out, away from my garden. 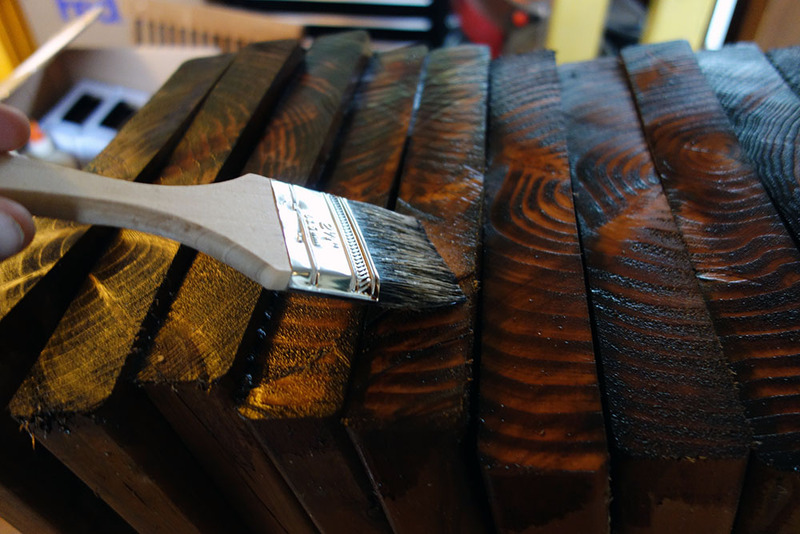 Brushing wood preservative onto cut ends. Beware these chemicals! 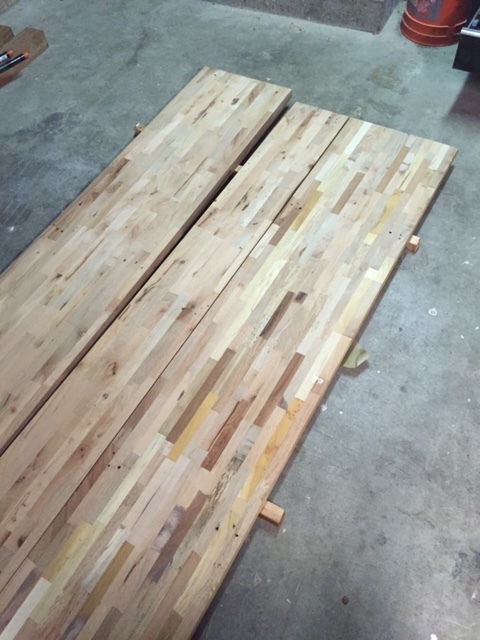 Now I had a big pile of 4′ lengths of 2×12 boards, each with one cut end which had been treated with wood preservative. After it had dried, it was time to assemble them into boxes. First, I combined pairs into “L”s, using two 3 1/2 zinc lag screws and zinc washers at for each pair of boards. I used a power drill to bore holes, then a wrench to screw in the law screws. Soon, I had many L-shaped boards. The Helpful Dog approves. 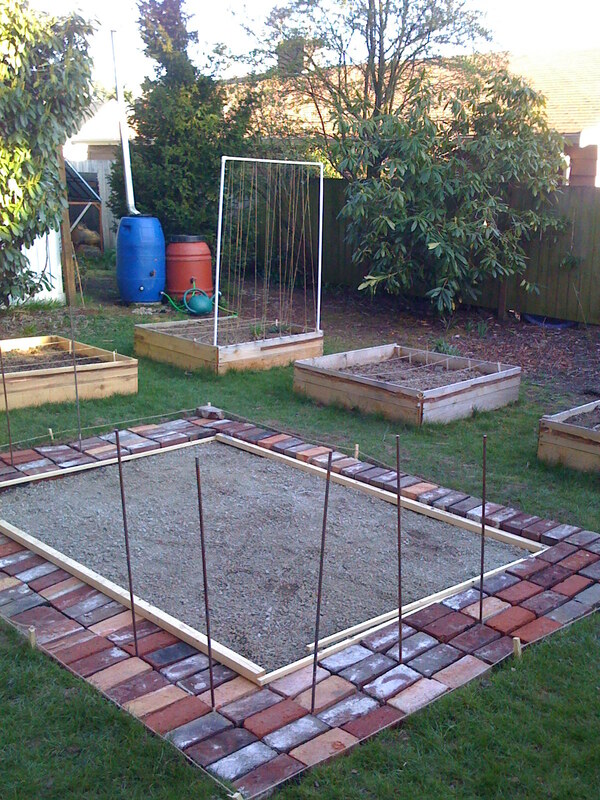 These L-shaped boards were then positioned around the garden beds, and combined to make squares. 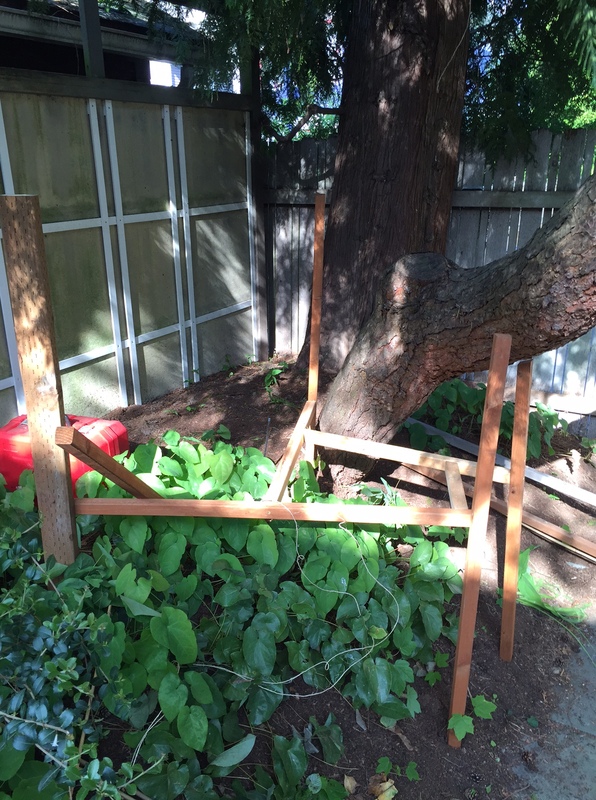 On the northwest side, I also bolted in two 6′ tall 4×4 vertical posts. 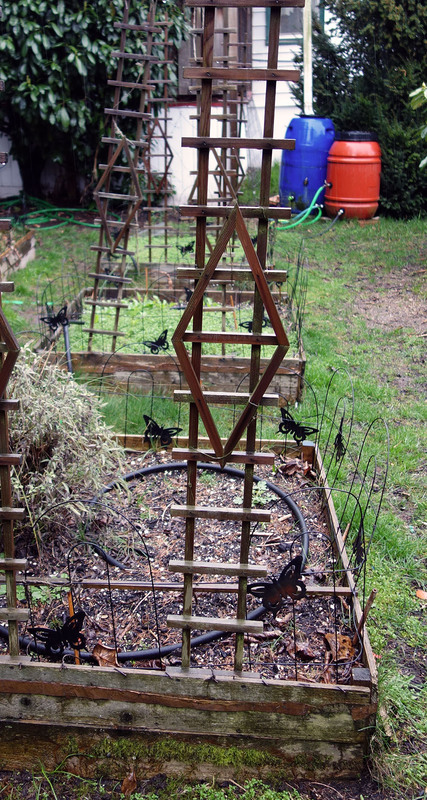 The last step was to finish the trellis portion, so the plants could have something to climb onto. For this, I was going to fit sections of 6″ mesh between the vertical 4×4 poles. I cut the mesh with a bolt cutter. I wanted to squeeze the mesh into holes cut into the 4x4s, so the mesh was cut to be a bit wider than 4′. 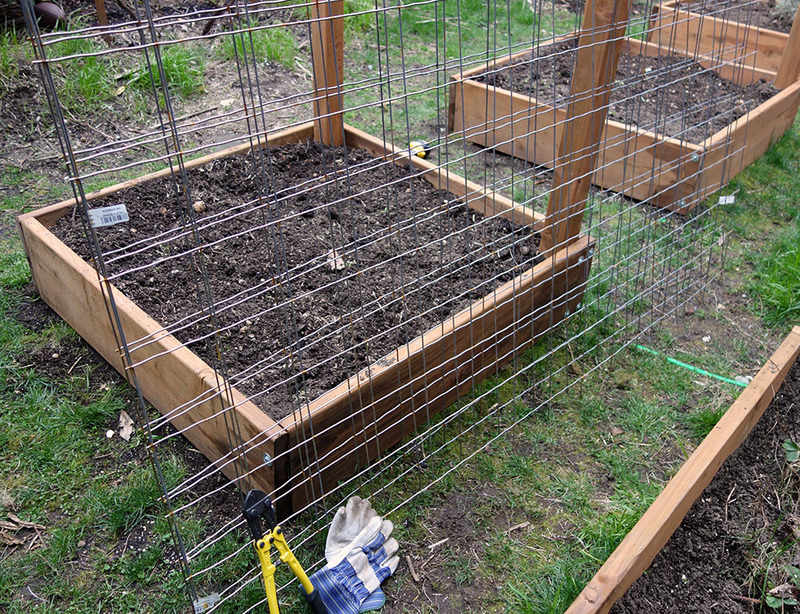 I drilled holes in the 4×4 posts which were 6″ apart, and jammed the mesh in. This turned out to be a pretty awkward project; you want to wear gloves, it’s easy to get poked! At last, the project was done! 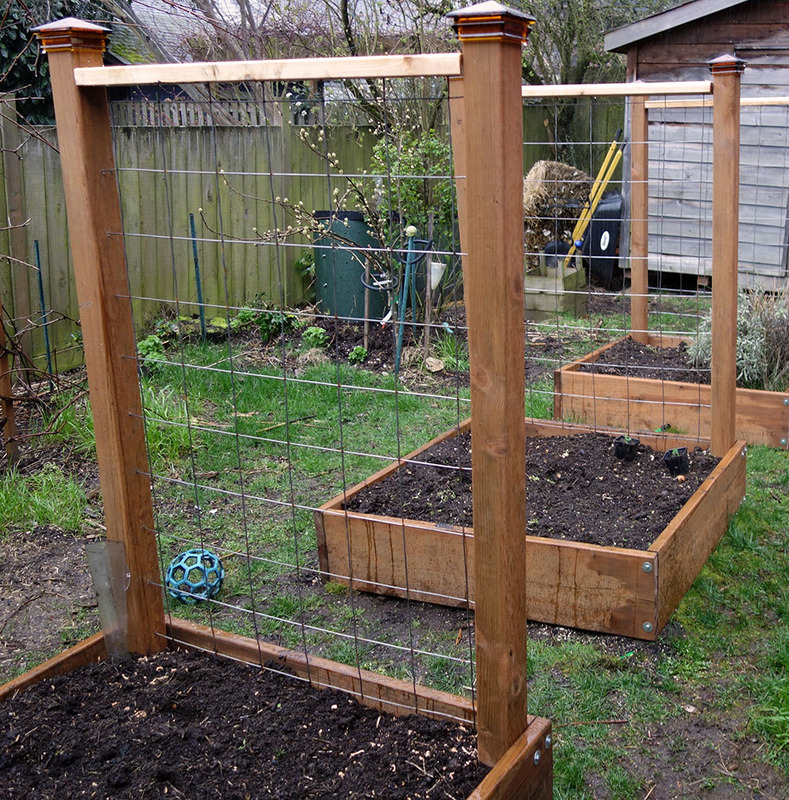 I put horizontal wooden 2x4s (cedar) at the top of the trellis. As a finish touch, I slid glass caps on the top of the 4x4s to add a touch of flair, and also to prevent water from soaking into the top of the lumber. Fast forward a few months, and you can see that the garden is booming!